To read the history of this once popular bar at the Royal Infirmary click here. Interior view of the Manx Bar in 1953. 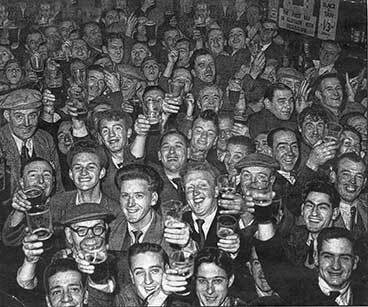 The Manx Bar was jam packed in 1953 when well-known publican Joseph Kelly decided to sell drinks at 1937 prices. 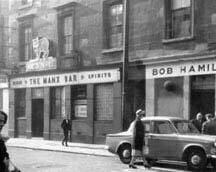 The Toonheid bar sat opposite the Royal Infirmary in Glebe Street. The tenement building above the pub was taken down in the 1960s as part of plans for the Townhead interchange, however the single storey bar survived until 1991. Outside of the pub was easily identified by a large neon sign of a Manx Cat. The locals sometimes called the pub "Joe's Place". The front of the bar also had the three legs of the Manx Coat of Arms. All the Manx signs in the interior and exterior came from Mr Kelly's birth place the Isle of Man. This pub was the first bar in Glasgow to have a Television set installed. Before this time it was illegal to have a TV in a pub. Another view of the Manx Bar. 1960s. 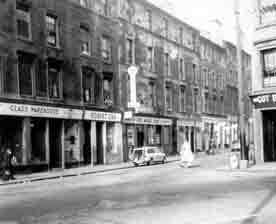 A view of Glebe Street with the Manx Bar on the left and the Cot bar on the right. 4 Glebe Street/ 69 Castle Street, Gilliland’s Bar. 31 Glebe Street/ 210-12 Stirling Road, The Royal Bar. 96-98 Glebe Street, The Tavern 1965. 99 Glebe Street/ 63 McAslin Street, Glebe Bar. 100 Glebe Street/ 132 Parliamentary Road. William Hutcheson's Bar. 122-124 Glebe Street/ 109 Kennedy Street, Argyll Arms. 123 Glebe Street Bull’s Head, 123 Bar 1956.